I kid you not, there is an event that eclipses Valentine’s Day… my sister’s birthday. She loves to celebrate her birthday to the full and this year was no different. She has staggered the birthday celebration to nearly a week..a new record. The grand finale was dinner at Duck and Waffle and she needed a special cake for this occasion so she turned to me. No pressure. 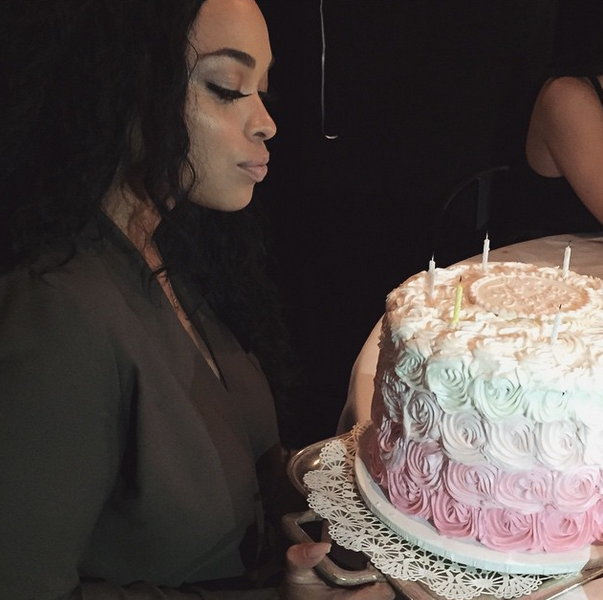 Her inspiration was a birthday cake she saw on Instagram. She wanted the ultimate princess cake with A LOT of pink and roses involved. With that request, I created this. 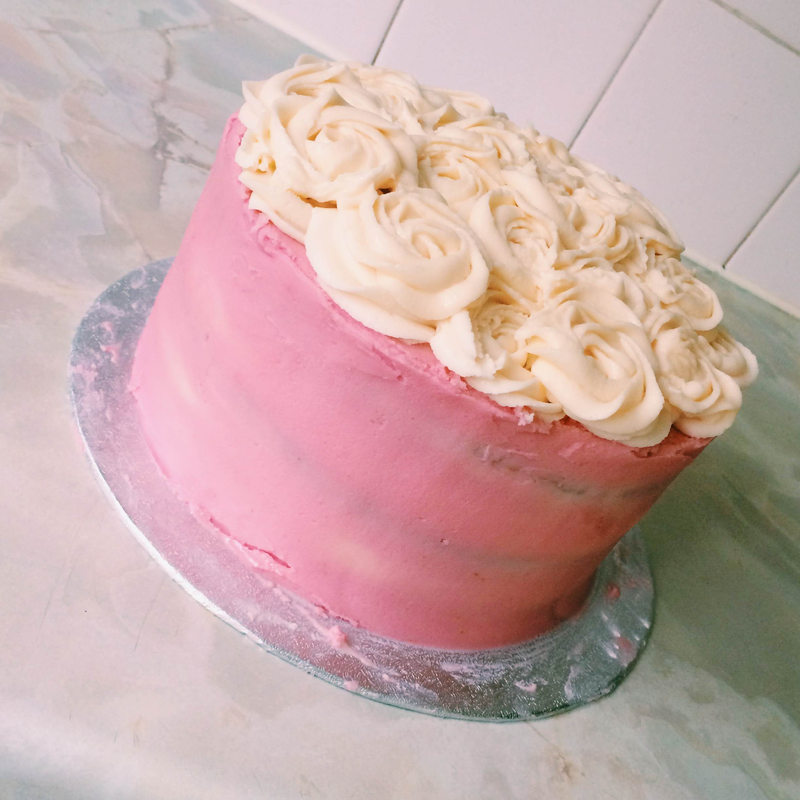 Different shades of pink vanilla sponge with pink buttercream and to finish, piped roses. This cake is perfect for any birthday celebration and with a little bit of patience and time, it is quite the showstopper. Two different shades of pink food colouring. I used Dr Oetker Hot Pink Gel and this one from Lakeland. Using an electric whisk, cream the butter and sugar together until it is pale and fluffy. Add the vanilla extract and beat again until the vanilla extract has been fully incorporated. Beat in the eggs one by one. Add a tablespoon of flour if the mixture starts to curdle. Fold in flour and baking soda. Finally add in the milk. It should have a soft drop consistency. Yes? Okay using scales, equally divide the mixture into three bowls. 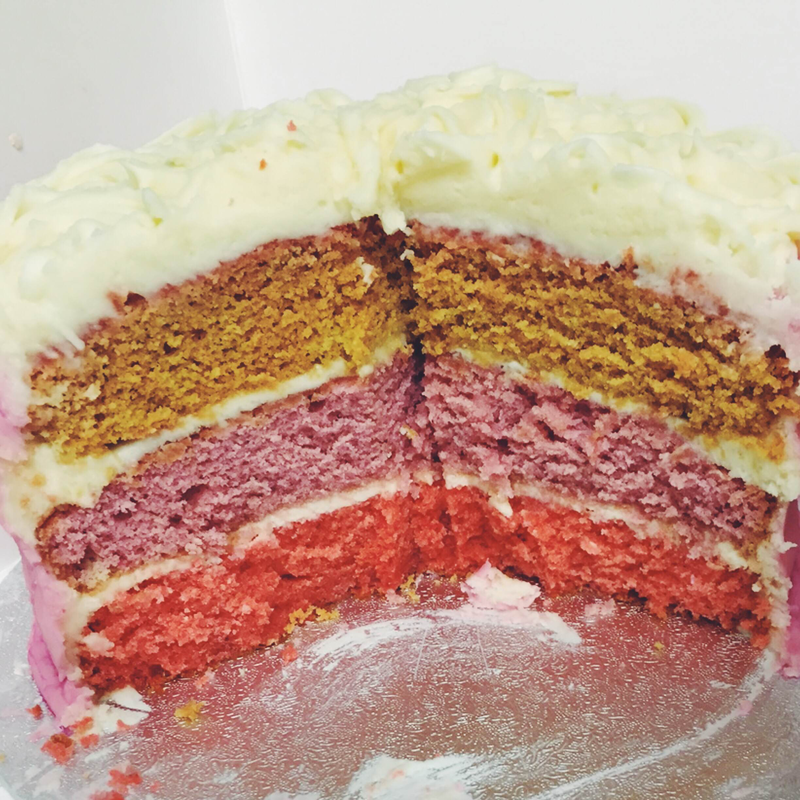 Add the Dr Oetker pink gel into one mixture and the pink food colouring from Lakeland into the second mixture. Keep the third mixture plain. Once you are happy with the colours, spoon the mixture into three cake tins. Level out the mixture and place in the oven to bake for 20-25mins. If the cakes spring back to your touch then they are ready to come out of the oven. Leave to cool in the tin for a few minutes then take them out of their tins to cool further on a wire rack. This is the stage I always get impatient with. In my hast, on a dry day, I leave cakes to cool in their tins on the window ledge in my garden. That is just me. You do not have to follow this step but I find my cakes cool much quicker this way. Beat butter and icing sugar until it resembles dust. Buttery dust! Nice! In a separate jug mix the vanilla extract and milk. Pour the milk mixture in the icing sugar mix and beat at a high speed for a few minutes. Place the dark pink sponge at the bottom, light pink then plain sponge and sandwich with buttercream. Give the cake stack a crumb coat with the buttercream and place in the fridge for 15-20mins to set. Split the remaining buttercream into two bowls. In one bowl add drops of pink colour paste. I used Wilton Christmas red to achieve a magenta looking pink. Using a palette knife cover the sides with the magenta buttercream. To achieve sharp edges, my trick is to dip the knife in warm water and wipe then proceed in smoothing out the cake. I crave a sharp smooth finish which means I spend a good while on this step. 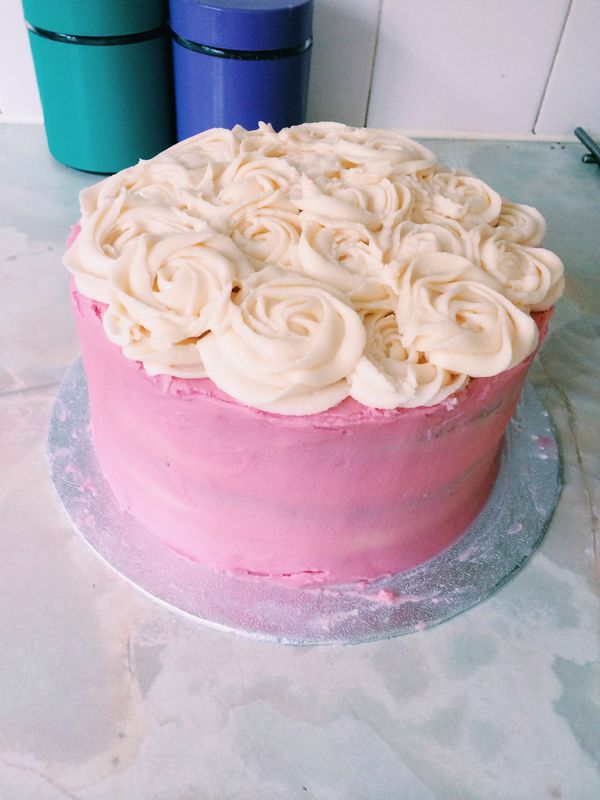 Once you are happy with your pink cake, lets get to piping. 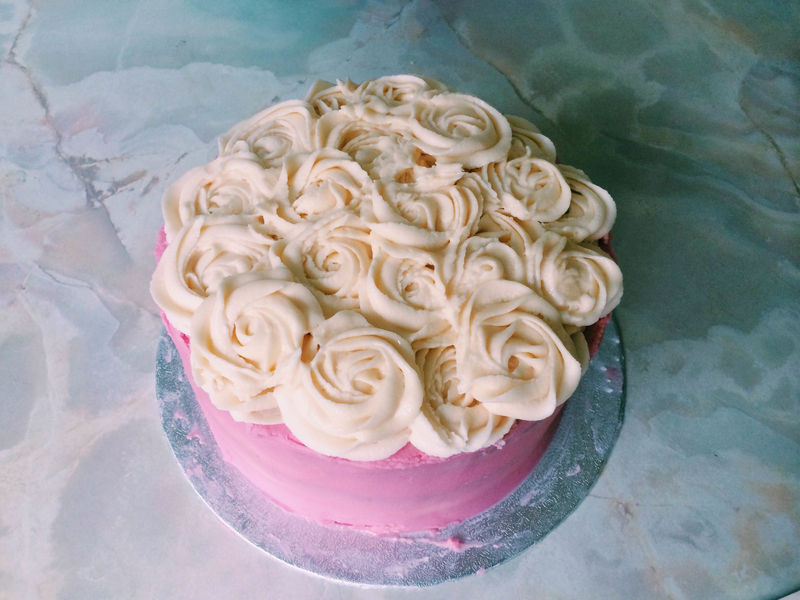 Fill a disposable piping bag with a 1M Wilton nozzle with the vanilla buttercream and proceed to creating roses. To make your rose, start in the center, then slowly move your tip in a circle around the center point. It is a labour of love but once you see the end result, it is worth it. 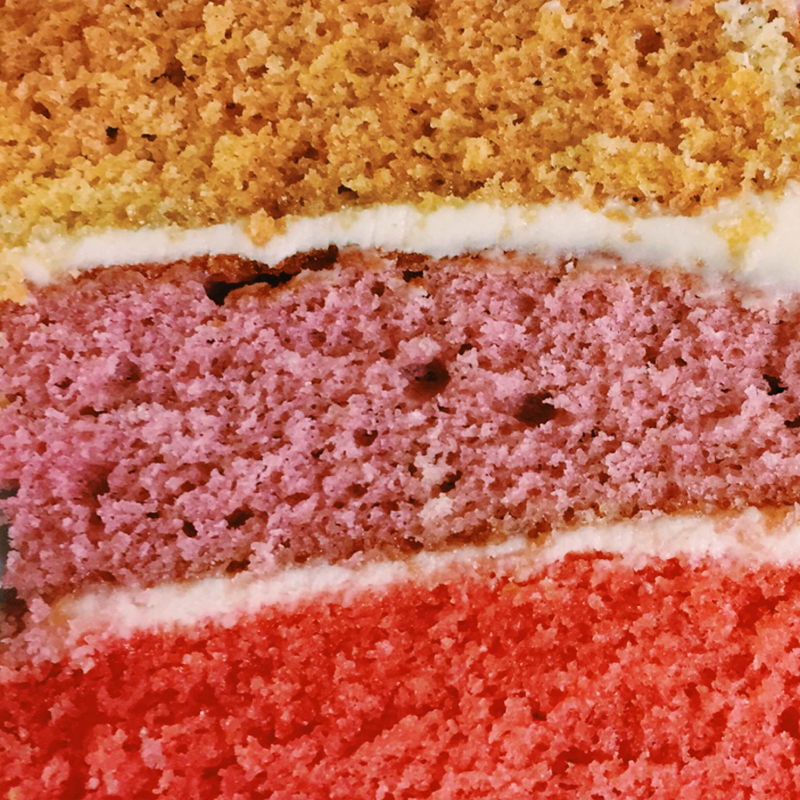 gorgeous pink layers..and the sponge tastes scrummy. Hope I have inspired you all to create a cake fitting for your loved ones. A very unique cake for a very unique girl! 😉 Looks great!